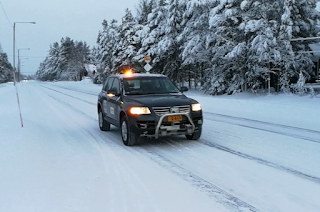 Scientists at VTT Technical Research Center of Finland have developed the 1st robotic car that can safely drive on snow and ice covered roads. It's fully autonomous, can go up to 25 mph and is called Martti. Martti is a research vehicle on the chassis of a VW Touareg. Martti's equipped with advanced sensors, laser scanners, antennas and cameras. It's designed for very demanding weather conditions. It has 3 laser sensors sensing the environment in front of the car. The Finnish scientists have put Martti through rigorous road testing conditions. 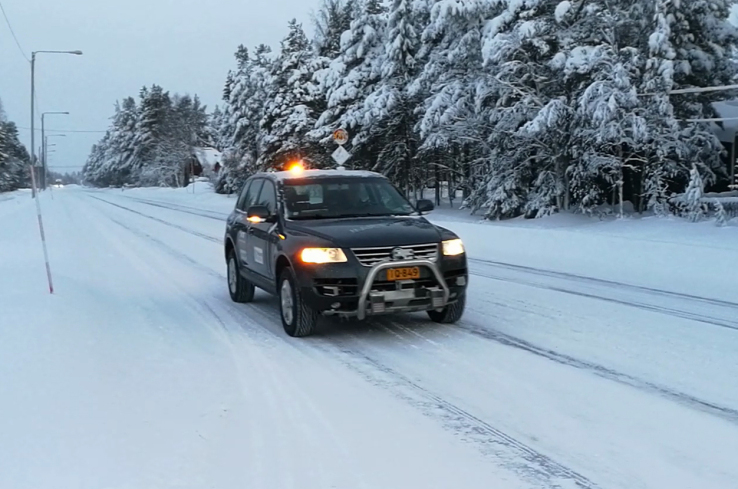 They believe it set a new world record for fully automated driving doing 25 mph in a snowstorm on fully snow and ice covered roads where you couldn't see lane markings. The vehicle can travel faster but is programmed not to go over 25 mph in test drives. This vehicle paves the way for an alternative source of winter travel for commuters. Next step for the scientists is to build more intelligence into the software monitoring the sensors, increase radar resolution and change the wavelength of the optical components. All to enhance the vehicles operating capabilities in tough snow, ice, fog and limited visibility conditions.